Let's be careful of our motives in all things. God judges the heart and is not deceived. We don't have to be famous in this world to "be somebody". Along with earthly fame comes multitudes of temptations that lead many to hell. Earthly fame is fickle and fleeting. When we repent and give ourselves to Jesus as our Savior, there is a party in heaven over our decision!!! Luke 15:10 Now THAT'S being somebody! That's the highest kind of "fame", to have one's name written in the Book of Life! No man can take that from us and age won't diminish it. 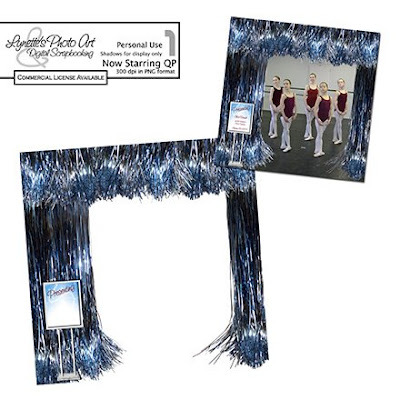 Today I'm giving you a QP I made using my Tinsel Waterfalls and an image of ballerinas from the web. You can customize the theater sign for your image. If you missed the Tinsel Waterfalls, they are in the archives on the left. Thankyou for this QP....like how you used the tinsel as a curtain. Thank you for sharing the word of God on your site and for the lovely quick page. Thank you so much for this Freebie. I want to let you know that I posted a link to your blog in Creative Busy Hands Scrapbook Freebies Search List, under the Quick Page(s) post on Mar. 08, 2009. Thanks again.